Shrine Guardian is an epic Willpower creature card. It is part of the Houses of Morrowind expansion. "I long to feast on their marrow." "The things I'll do to their corpses..."
This card's ability applies the Challenged card effect. 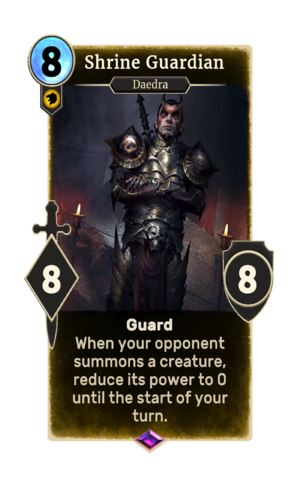 This card is a reference to Anhaedra from Morrowind. The Maar Gan Shrine is visible behind him in the card art. This page was last modified on 1 March 2019, at 23:47.